Agnes joined the Thomson Reuters Foundation in 2017 and is responsible for managing relationships with TrustLaw’s network of NGOs and social enterprises in Sub-Saharan Africa. She supports various research programmes on regional and cross-border issues such as land rights, human trafficking and legal reform. She has a special focus on Women’s Rights and Social Enterprise. Prior to joining the Foundation, Agnes worked as an Associate at Deloitte, where she advised clients on corporate governance and commercial matters. Before this, Agnes gained experience in the non-profit sector working as a Legal Associate at Acumen, East Africa. 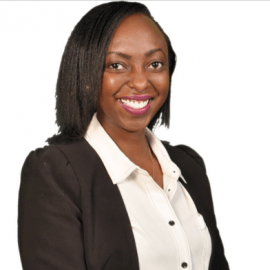 She also previously worked in private practice as a lawyer at Walker Kontos Advocates, a leading law firm in Kenya, where she advised clients on various property and corporate matters. Agnes is an Advocate of the High Court of Kenya. She received a first class Master’s Degree in Business Management from the University of Bristol and also holds a Law & Business Administration Degree from Keele University.